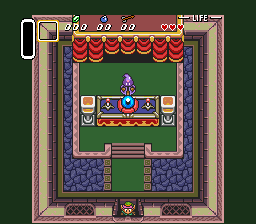 SNES The Legend of Zelda: A Link to the Past (JPN v1.0) "game end glitch" in 00:54.53 by fmp, total & Yuzuhara_3. SNES Zelda completed in a very quick manner. The trick that is used to cut completion time by so much is holding left+up+right while entering a corridor or staircase, allowing Link to clip through the wall and walk out of bounds. This movie is an astonishing minute faster than the preceding version thanks to a brand new glitch.